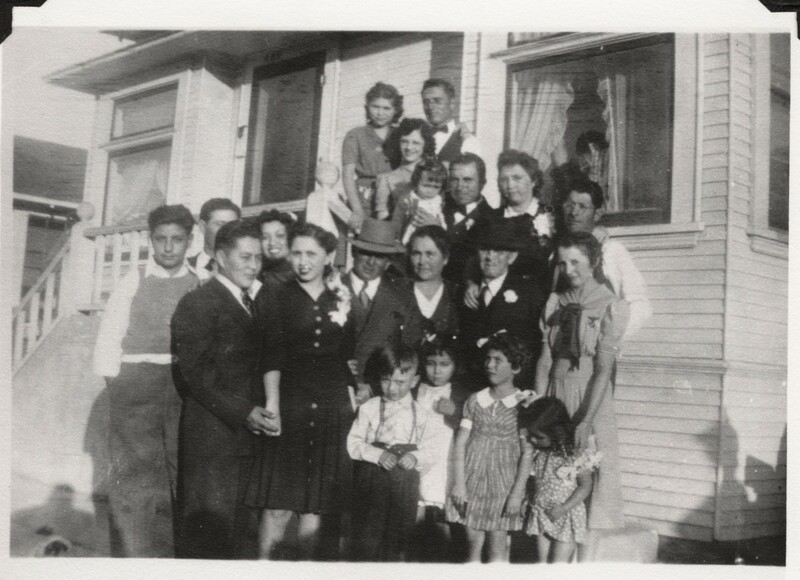 I know that I am not the only person to have to face ancestor stories that aren’t very pretty, and in fact, some are quite messy. To say Jose Eusequio Jaquez’ story is a bit of a mess would be appropriate. His family could have had the 19 Kids and Counting show (I think!) Ha, well, dive in. Let’s see if we can untangle this a bit. 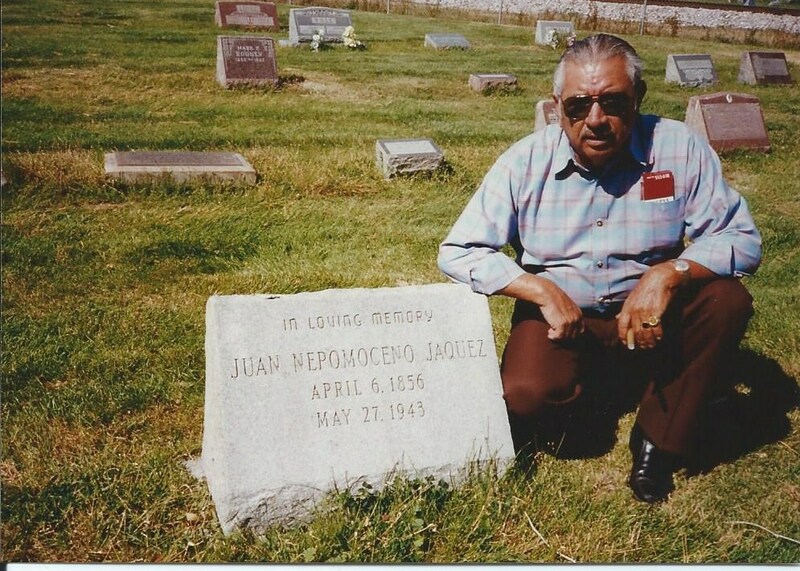 Now he is the father of Juan Nepomuceno Jaquez, my dad’s grandfather. 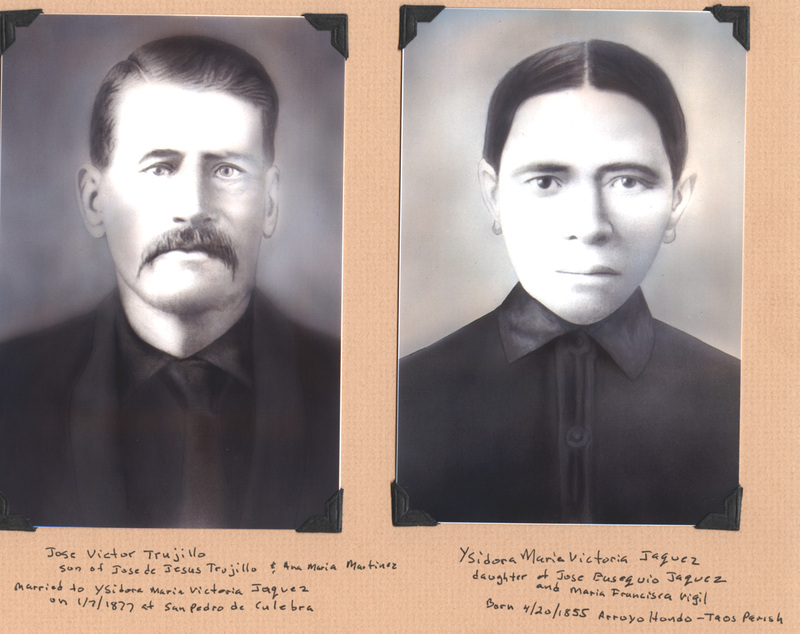 My father had only warm feelings and great respect for Juan N.
Anyway, in 1860 Eusequio, age 31 and Francisca, age 28, live in the precinct of Culebra in the Taos Territory of NM. This census was taken on July 18, 1860. 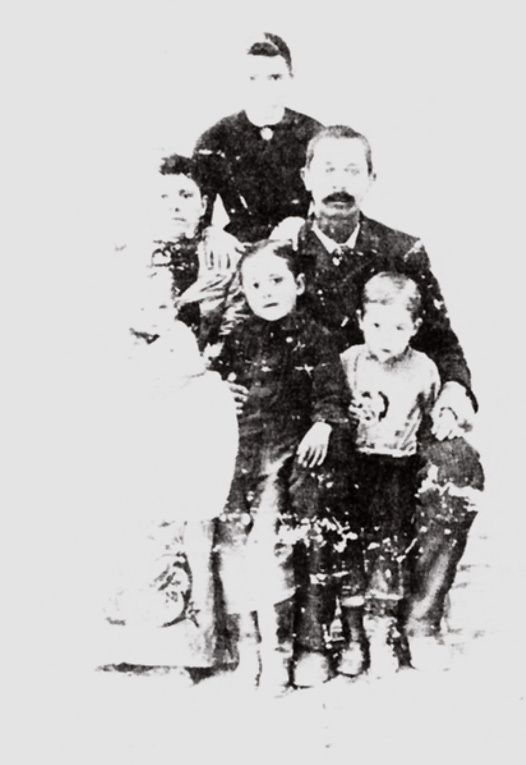 Their children listed at this time are Victoria, age 5, Juan Nepi, age 3 and daughter Josefa, 9 months old. 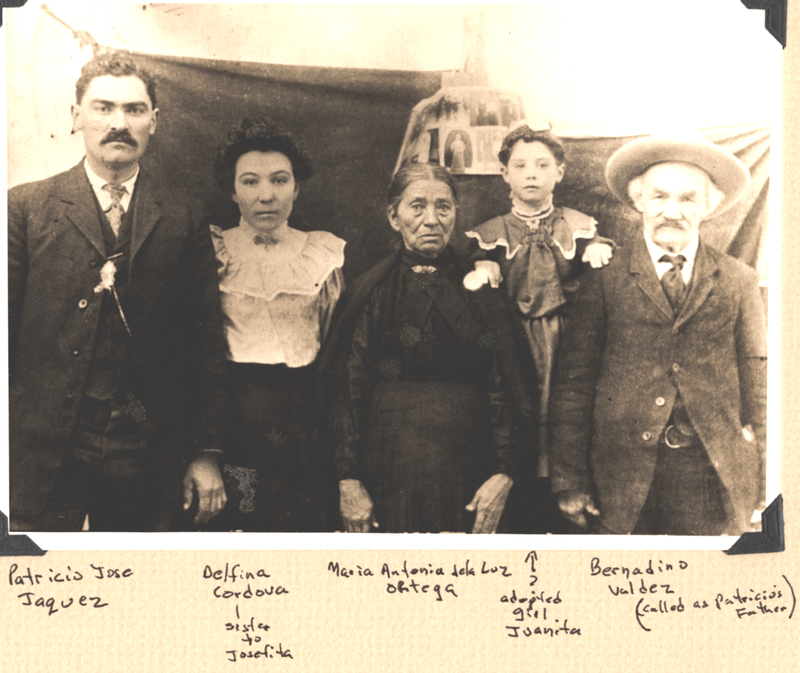 Three short years later, in 1863, Maria Francisca Vigil Jaquez died in Conejos County, Colorado. Now, since Joe Eusequio isn’t listed on the 1860 census, I am thinking this one died as an infant. 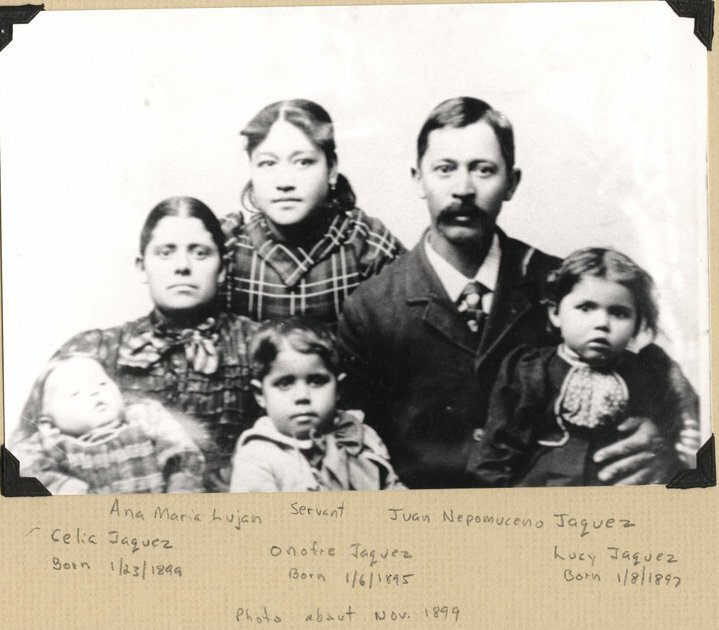 Also, Jose Ramon isn’t listed on this census because it appears that Francisca was only three months pregnant with him at the time the census was taken, as he was born in November of 1860. The last child I believe to have been born to this couple was Gertrudis Jaquez. Her date of birth is 7 May, 1863 in Conejos Co., Colorado. It sounds like Maria Francisca either died during Gertrudis’ birth or shortly thereafter. By the 1870 census Jose Eusequio has remarried. Teofilo, age 6 months old. Looks like Eusequio is age 9 now, so maybe he survived after all. 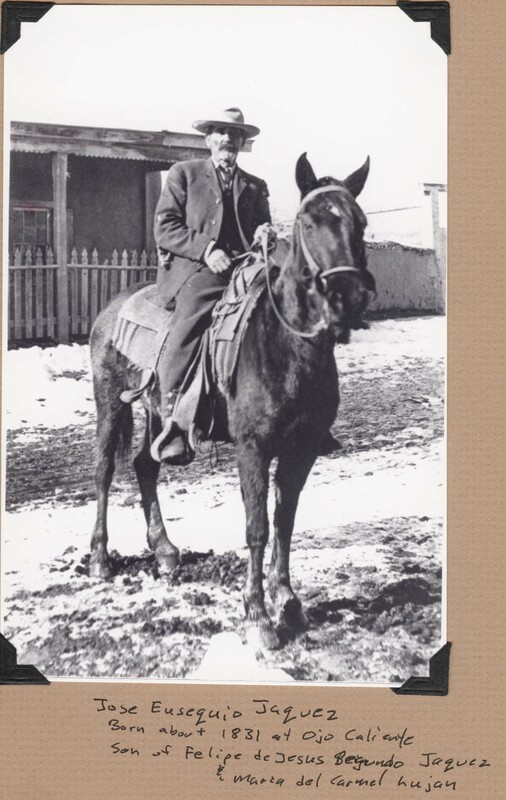 Not sure why he wasn’t on the 1860 census. Could be a mistake on the census taker’s part. It happens. 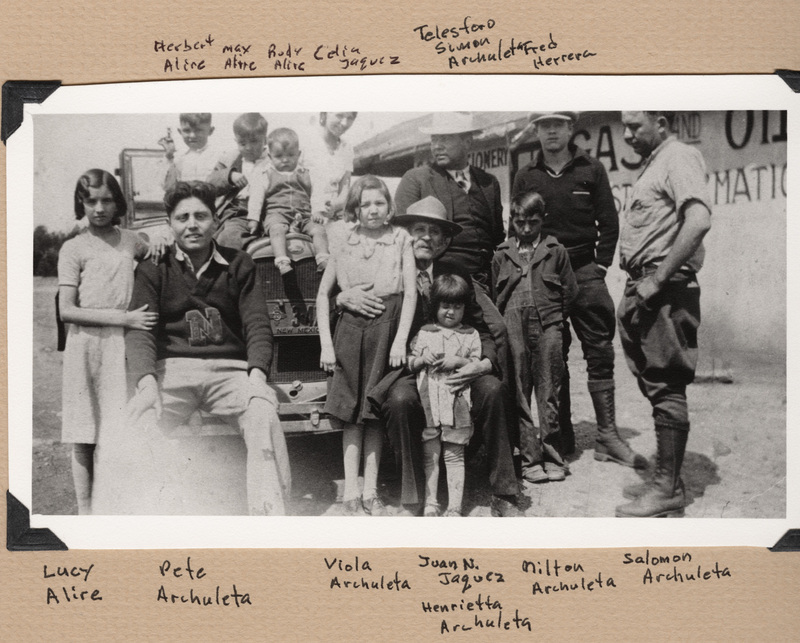 Anyway, Antonia De La Luz Ortega took up where Francisca left off: having babies. The first two children could have been from the first spouse, so my guess is that his natural children start at Teofilo, but I am not positive. So, Antonia would have been 48 years old when she had her last child. Not unheard of but sheesh! That is a hell of a lot of kids. Made my head hurt trying to keep everyone straight. 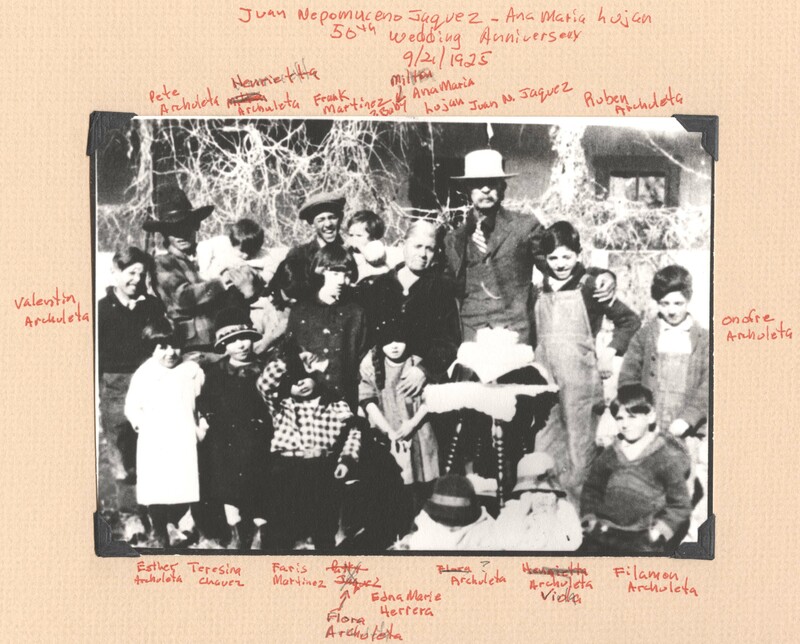 So Juan N. was one of six children between his father and mother, then he was a half brother to 13 more siblings, 19 all together. 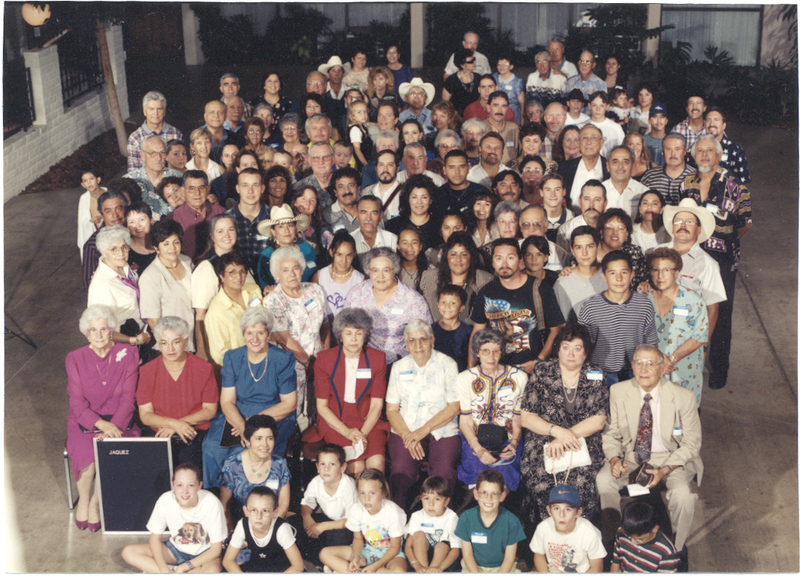 This is Antonia De La Luz Ortega in the middle of this picture. Also in this picture is Patricio Jose Jaquez. He does look a great deal like Juan N. to me (I believe them to be half brothers). Also in the picture are his wife, Delfina Cordova and their adopted daughter Juanita. 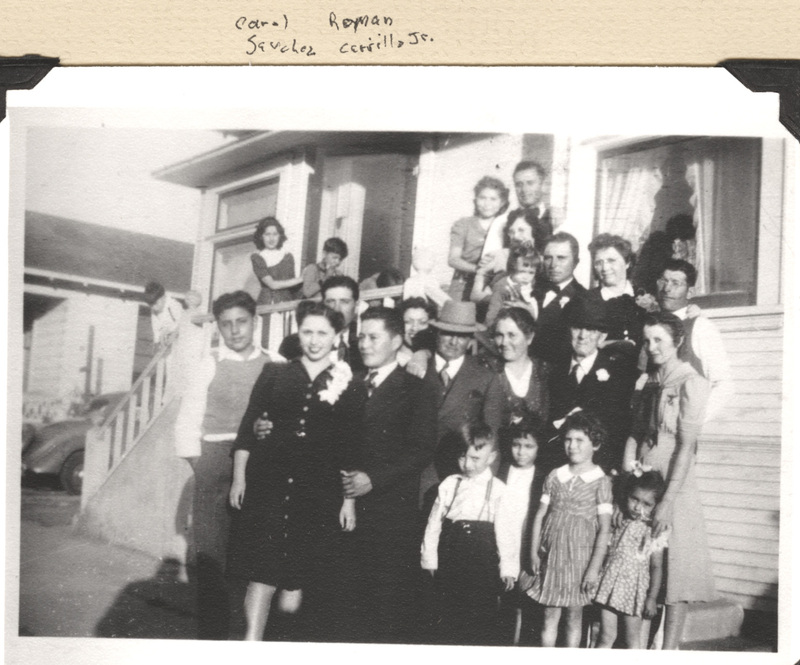 The last person in the photograph is Bernadino Valdez. 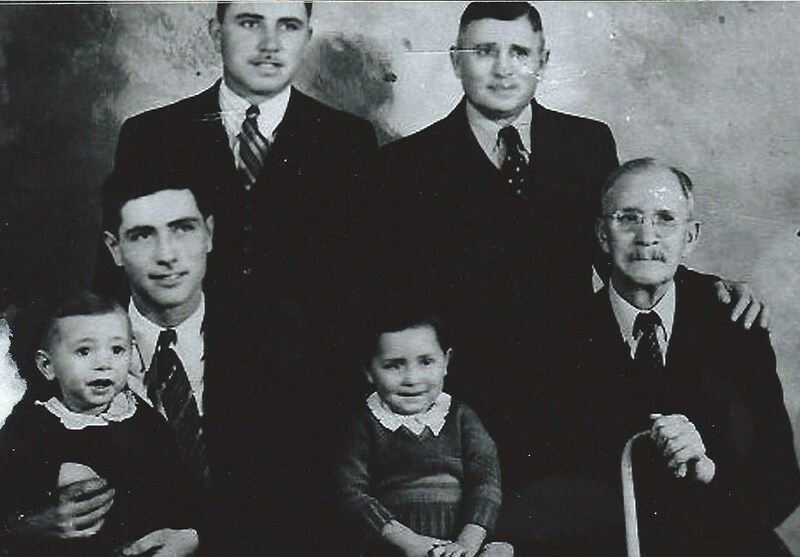 The bottom of the picture says that he is called as Patricio’s father. Not sure who he is or why it says this. Could she have had an affair? I guess so. Could he really be a Valdez and not a Jaquez? Yikes, no way to be certain. 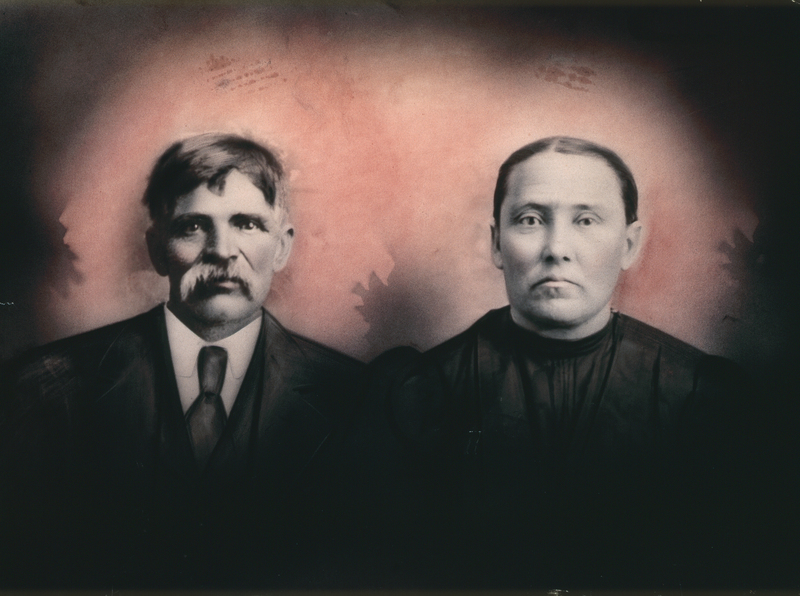 I found the 1910 Census and found them living in Costilla, Colorado. He is listed as age 32, she is 26 and Juanita is age 7. 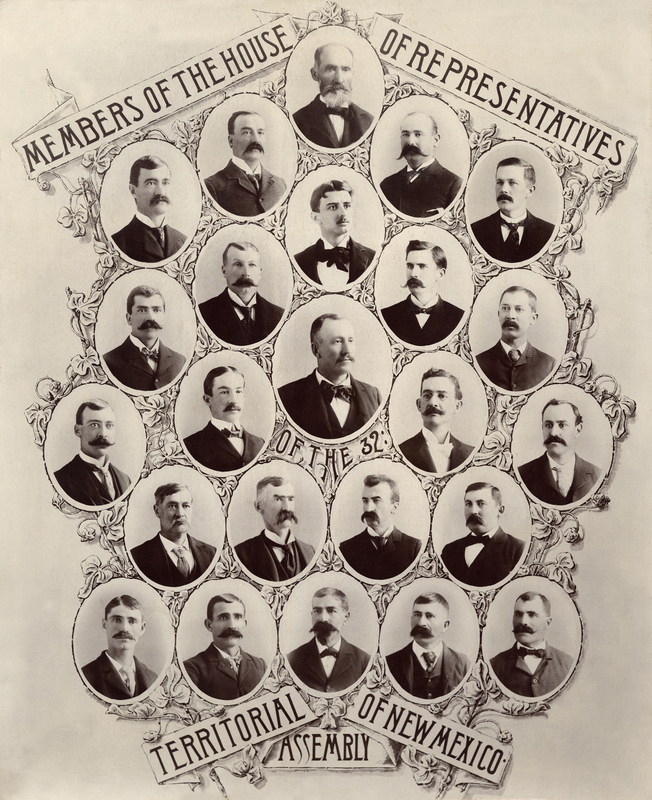 It appears that this is when this photograph was taken as well. This would make Antonia De La Luz Ortega Jaquez age 69. Wow, she’s really aged from having all those children. 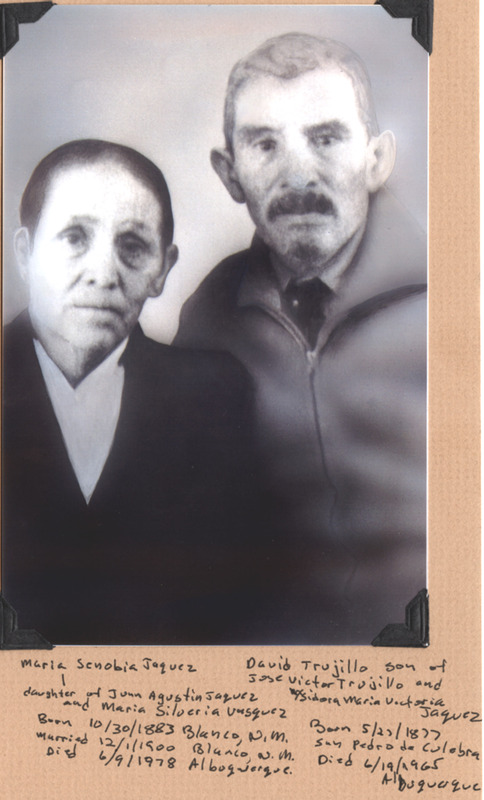 This is a picture of Ysidora Maria Victoria Jaquez and her husband Jose Victor Trujillo. She is a full sibling to Juan N.
David is the son of Victoria Jaquez Trujillo and Victor Trujillo. 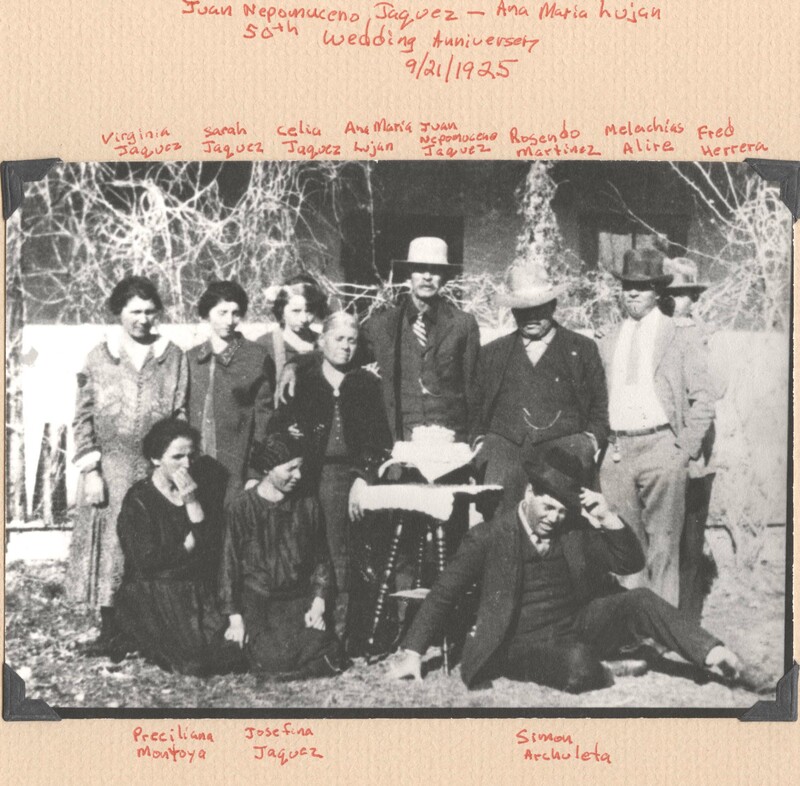 Maria Senobia Jaquez is the daughter of Juan Augustin Jaquez and Maria Silveria Vasquez of Blanco, NM. 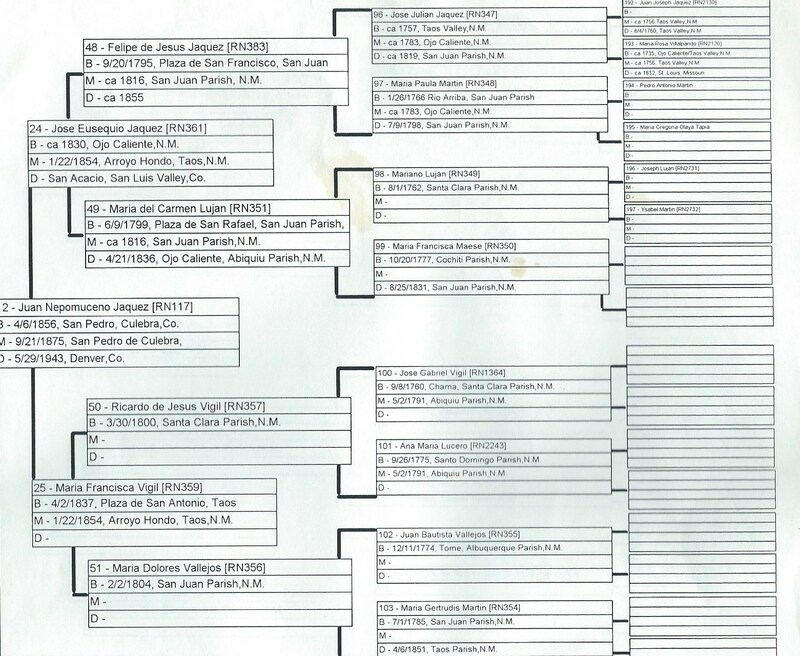 Oh yes, of course, not only are we related to David Trujillo, his wife is related to us by blood as the daughter of Juan Augustin Jaquez. *** Correction*** This photograph was mislabeled. The information below stays the same and is still correct. However, this photograph was labeled incorrectly. This is Maclovio Archuleta ans Benina Martinez. Thanks to Cordie Jacquez for the additional information. 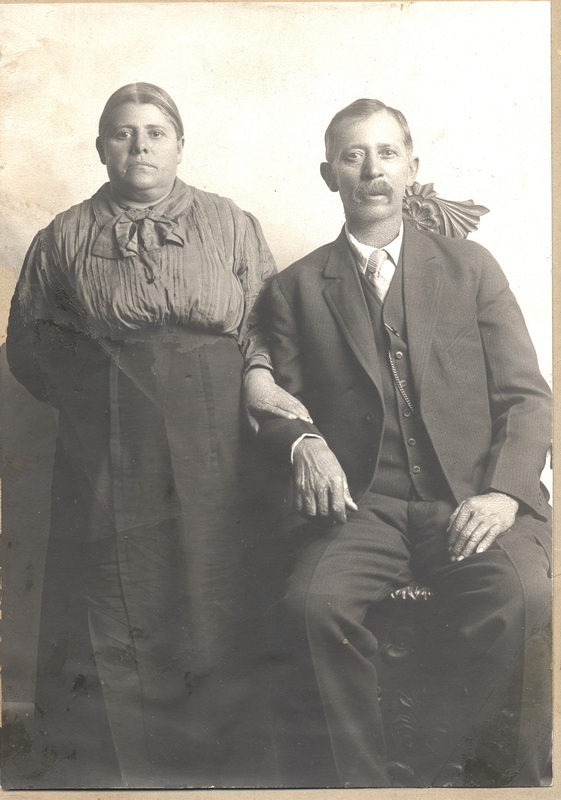 This is Juan Augustin Jaquez and his wife, Maria Silveria Vasquez. Juan Augustin Jaquez is the son of Jose Salome Jaquez. Jose Salome is the brother to Jose Eusequio Jaquez. Hey look at that, we’ve arrived back where we started with Jose Eusequio. Alright, people, move along, nothing to see here. I am certain your family twigs look just like this. Well, fairly certain. Fine, there’s lots to see, much to understand.